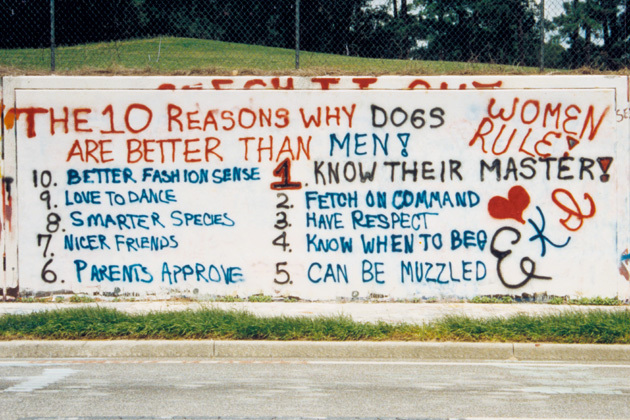 Date Photographed: c. 1995 Message: The 10 Reasons why dogs are better than men! 10. Better fashion sense. 9. Love to dance. 8. Smarter species. 7. Nicer friends. 6. Parents approve. 5. Can be muzzled. 4. Know when to beg. 3. Have respect. 2. Fetch on command. 1. Know their master! Love, EKI Women Rule! Message: The 10 Reasons why dogs are better than men! 10. Better fashion sense. 9. Love to dance. 8. Smarter species. 7. Nicer friends. 6. Parents approve. 5. Can be muzzled. 4. Know when to beg. 3. Have respect. 2. Fetch on command. 1. Know their master! Love, EKI Women Rule!